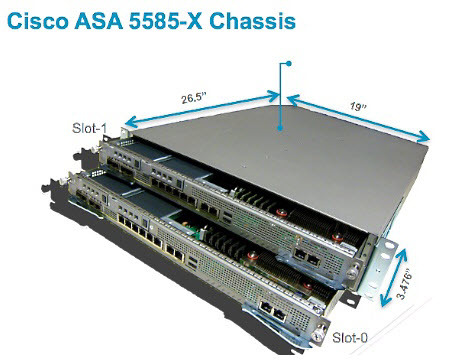 Nowadays, Cisco ASA 5585-X Series plays a vital role in the Data Center that is more important to the enterprise than ever before. To the need for high performance and scalable network security today, ASA 5580 was introduced to meet the 5 Gbps and 10 Gbps needs of campuses and data centers. 1. Expanding the performance envelope of the ASA 5500 Series to offer 2 Gbps to 20 Gbps of real-world HTTP traffic and 35 Gbps of large packet traffic. 2. Supporting up to 350,000 connections per second and a total of up to two million simultaneous connections initially, and is slated to support up to eight million simultaneous connections. The ASA 5585-X is highly suitable for the security needs of organizations with the most demanding applications, such as voice, video, and data backup, scientific or grid computing, and financial trading systems. 3 Throughput was measured using ASA CX Software Release 9.1.1 with multi-protocol traffic profile with both Application Visibility Control (AVC) and Web Security Essentials (WSE). Traffic logging was enabled as well. 4 Firewall traffic that does not go through IPS SSP module can have higher throughput. 5 VPN throughput and sessions count depend on the ASA device configuration and VPN traffic patterns. These elements should be taken into consideration as part of your capacity planning. Maximum throughput numbers are based on IPsec IKEv1 Remote Access VPN Connectivity.